No matter where they live, Grandparents can help their grandkids in many different ways. Sure, a birthday or Christmas gift is always appreciated, but seniors can also give something more important – emotional support. 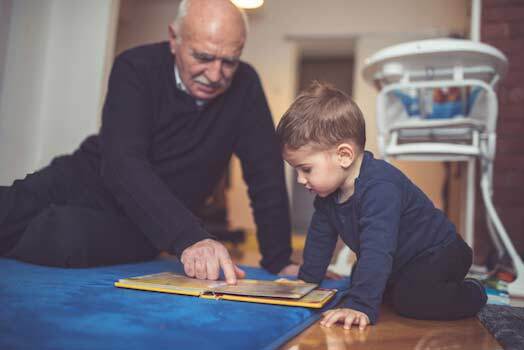 With a new school year approaching, an encouraging word from a grandparents can go a long way over the next nine months. If a grandparent shows interest in what they are learning, children learn that school/education is something of value. If a grandparent shows interest in what they are learning, children learn that school/education is something of value. Talking about what the kids are learning about, school events, and new friends they may be making are easy subjects to broach. But, be specific with your questions – asking about the best part of the day (and the worst) will show your interest. If the children are studying a particular time in history, share what you learned by living through it. When praising a grandchild for a job well done (in school or at an event), make sure to mention more than the end result. Talk about the preparation or extra work they did to help them reach their goals. It may be a cliche, but that doesn’t mean it isn’t true: it’s not the destination, it’s the journey. If you live near enough to your grandchildren, volunteering at the school can show them how much you value education. Find out who their teachers are, or ask their parents, about what you can do to help. This could be anything from being a guest speaker to a lunch buddy – anything that shows you care about your grandchild and their education. You’ve learned many things during your time on Earth – share them with your grandchild! Talk about your life experiences with them, help them finds books about what life was like when you were younger, or just show them how to follow a recipe for chocolate chip cookies. If you express an interest in reading, following directions, and lifelong learning, so will they. Sometimes, school can be overwhelming. With classes, homework, and even a sport, time can easily get away from us. Let your grandchildren know you are rooting for them and that the hard work and planning for future goals will work out for the best. After all, you did that and got a great grandchild out of it! Even if you aren’t in the same city, an occasional note or phone call will let your grandchild know you are thinking of them. It could inspire them to do the same for their grandchildren.